The Financial Futures Association of Japan (FFAJ) has published its monthly update on FX and binary options volumes seen at retail Japanese brokerages listed with the association. The OTC FX monthly bulletin is accompanied by the personal OTC binary options bulletin showing that whereas forex volumes have sharply increased amongst Japanese brokers in the month of September, binary options interest remained unchanged. The FFAJ lists 61 OTC retail FX margin trading operators with firms such as GMO Click, IG Securities, JFX and Waijei FX among the names, although only 50 brokers report trading figures for collation. The 7 trading members and 1 intermediate member of the JJAF are GMO Click Securities, Traders Securities, IG Securities, JFX, Planex Trade, YJ FX, Hirose FX and FX Trade Financial. The significant change in total FX trading volume ¥378 trillion ($3.53 trillion) in September to ¥503 trillion ($6.24 trillion) in October represents a 33% month-on-month increase. Compared to October 2013, FX volumes rose 89% year-on-year. 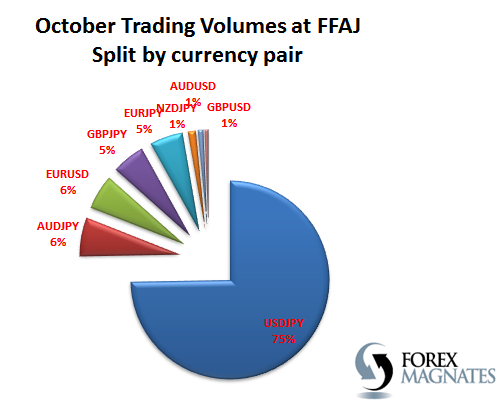 In terms of currency pair preference, USD/JPY accounted for a larger share of total trading volume, rising from 73% in September to 75% in October. AUD/JPY volumes have risen sharply from last month – most likely due to macroeconomic developments in the APAC region. Bank of Japan monetary policy has been the big theme for JPY pairs and all JPY denominated assets over the past month. European-based traders tend to focus on EUR/USD, whereas in Japan only 5% of all trading volume was conducted between the euro and the US dollar. The cumulative figures published by the FFAJ predictably indicate that the raft of positive volumes reports from Japanese brokers since the end of September adds up to a superbly lucrative month for the Japanese retail trading industry. The FFAJ also publishes statistics relating to OTC binary options products being offered by Japanese brokers. OTC Retail Binary Options figures do not include binary option transactions traded by corporates or institutional investors. 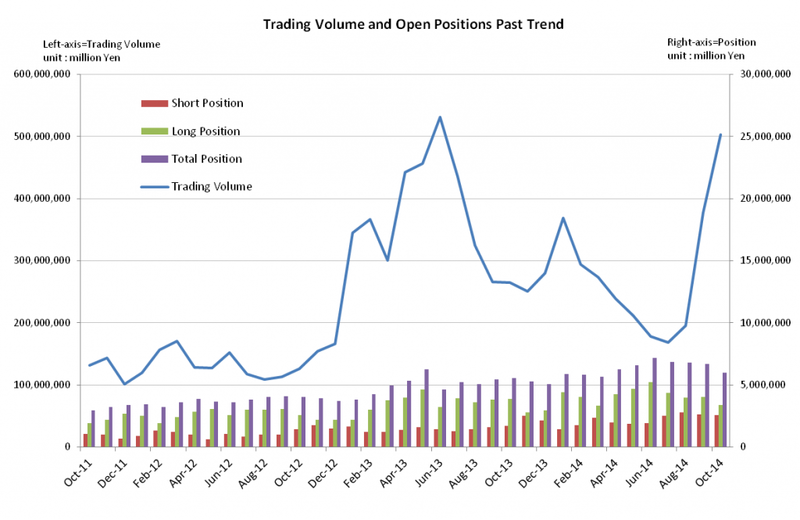 The 8 reporting members saw no change in binary options volume in October with ¥57.2 billion (~$536 million) being traded during the whole month, almost the same as ¥57.5 in September.